Edelman's Trust Barometer 2019 just got published. Once again this year it states that the source within your firm that people trust most is your Experts. Year-on-year the trustworthiness of company technical experts has also increased. This is very much in line with previous annual Trust Barometer Reports. This is fantastic news for professional services firms who are stacked with exactly those experts (lawyers, accountants, advisors of every hue) and consultative tech firms (again full of subject matter experts). Also good news for these firms is that coming in just after technical experts as a trusted resource is 'A person like yourself' and a 'regular employee'. 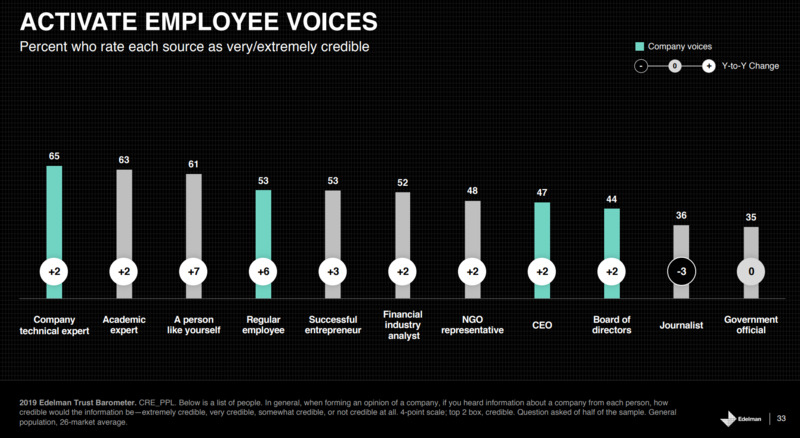 All firms need to do is activate these voices and empower their experts. The 2019 Edelman #TrustBarometer launches on Monday. Last year, our analysis revealed a flatline in trust across all four institutions. Who do people trust the most?